I purchased the car only a few months ago, but since then I inherited yet another vehicle. I refuse to park the Z outside, but I'm out of room so it needs to go. Although the body has 409k miles on it (! ), it has been restored and well-maintained over the years. It drives great, and I occasionally drive it to work and back (~30 miles) with no issues. I purchased it from the second owner, who had documentation going back to the mid 1990's. Interior is average, maybe closer to "good" considering the age. It's clean and presentable, but there are some worn places here and there, and a few panels missing in the back hatch area. Mechanically the car is sound. Brakes, clutch, tires, suspension, cooling system, starting system, turbos, transmission all seem good. The AC doesn't blow as cold as it should. I suspect it needs a recharge. Price includes several boxes of spare parts, including some misc interior pieces, rebuilt and flow tested injectors, coil packs, etc. I have seen 280zx Turbos go for more money than this. And as you can imagine, the performance of this car (braking, acceleration, handling both at low and high speed) is incredible. This is a great, daily-drivable TT survivor. I'm located in Charlotte NC not far from the airport. I'm willing to ship the car at buyer's expense. Asking $6,999 or best offer. Last edited by vce; 03-29-2017 at 08:11 PM. 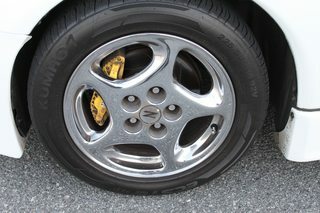 Although the oem wheels at 16" are small by today's standards, these are in great condition with no curb rash. Let's hear some offers on a clean TT!